Aatank Hi Aatank (which Wikipedia translates as “Terror Everywhere”) is a 1995 Hindi gangster film directed by Dilip Shankar. The star cast includes Rajinikanth, Aamir Khan, Om Puri, and Juhi Chawla. The movie feels just like an average gangster movie. I’ve read that Aatank Hi Aatank is a remake of The Godfather (which I still haven’t seen so I have no idea how much of the film is inspired by it). The story is about a former farmer who becomes a gangster boss in Mumbai. Then some family drama happens and we learn that it’s not easy to be a gangster’s wife. The film is also a revenge drama and eventually almost everyone gets shot and dies. The story isn’t very interesting and the final 15 minutes are the longest ever. The songs too aren’t very good or catchy, except the gangster rap which is hilarious. Rap rap rap, goonda rap! I am bad, and I am mad! I said I’m bad. Ma-ma-ma-mad! 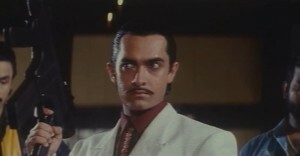 The cast is good but Aamir was maybe a little too young for his role. And he looks so slimy with his hairstyle and moustache in the second half of the film! 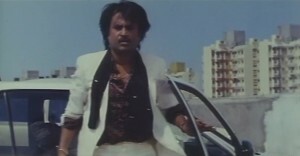 Rajinikanth performs and looks just fine. Some forum posts say that the (unsubtitled) Moser Baer DVD is heavily cut. That’s unfortunate, but apparently the uncut version of the film is on Eros Now and even has English subtitles! I would still like to buy the DVD (as I have it in my collection only on a crappy 3-in-1 disc) but looks like it’s sold out everywhere! Maybe I should finally watch The Godfather, as my watchlist has at least a couple of other Indian films that are also inspired by it.